Could there be any more direct evidence of an organization that promoted false prophecy in the name of God? 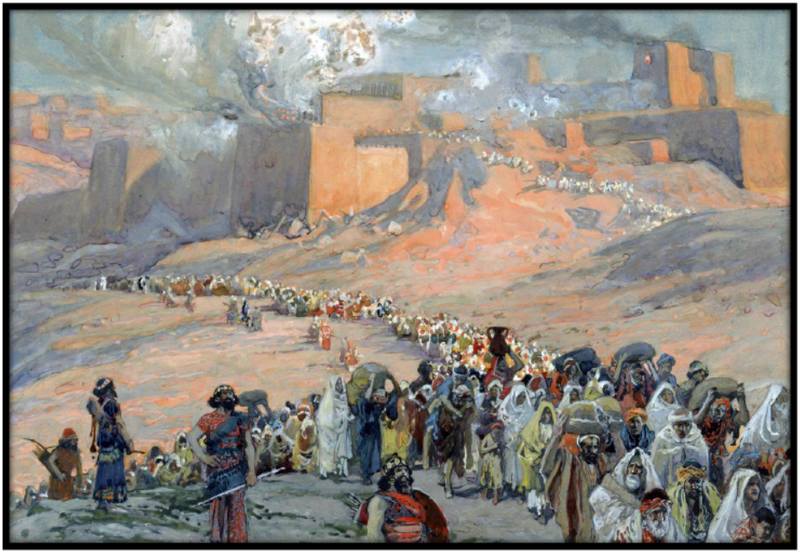 How could Rutherford say that his followers had more reason to accept his prediction of 1925 than Noah had to believe the words directly spoken by Jehovah? Another quote gloated over the expected failure of those criticising the 1925 predictions. The following quote shows the superstitious nature of Watchtower followers regarding Watchtower publications, and at the time their continued belief in the relevance of the pyramid. 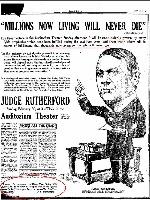 After 1918, the Millions teaching became the central focus of the preaching effort, being delivered through a series of public lectures by Rutherford and other brothers. 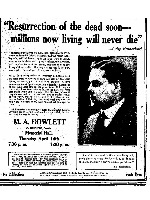 These were advertised in local newspapers, as displayed in the following clippings. 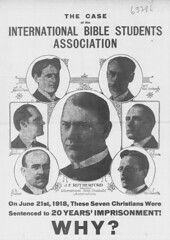 Preaching that the earthly resurrection would commence in 1925 resulted in tremendous growth for the Watchtower Society. The converse occurred after 1925 came and went without incidence. 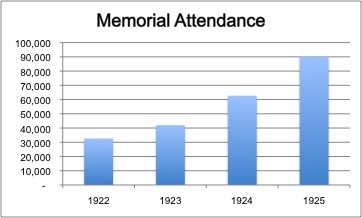 No figures were reported for 1926 or 1927, but in 1928 numbers were around half that of 1925, with memorial attendance of only 17,380, and 44,080 average publishers. 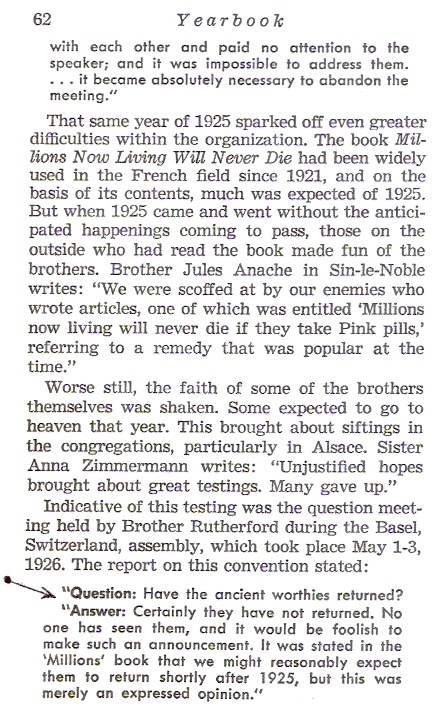 (Jehovah’s Witnesses in the Divine Purpose p.313) It is estimated that as many as 75% of publishers left the religion and by 1935 memorial attendance was still only 63,146.3. It took until 1940 to once again reach the same number of Watchtower followers as the 1925 era. It is reprehensible that from the moment Rutherford’s prediction proved wrong (and continuing to this day) the Governing Body shifted the blame for the false expectation away from themselves and onto the members. Rather than accept responsibility for stumbling followers with their false 1925 teachings, Watchtower derogatively describes these ones as chaff. The Proclaimers book properly indicates that early Bible Students believed the majority of worldly people would survive Armageddon. 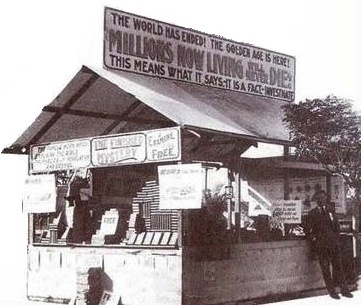 More often though, the Watchtower misleadingly indicates that the teaching of ‘millions now living’ was overoptimism and coincides with the current doctrine that only Witnesses would be saved as part of the Great Crowd. These statements are complete falsehoods. 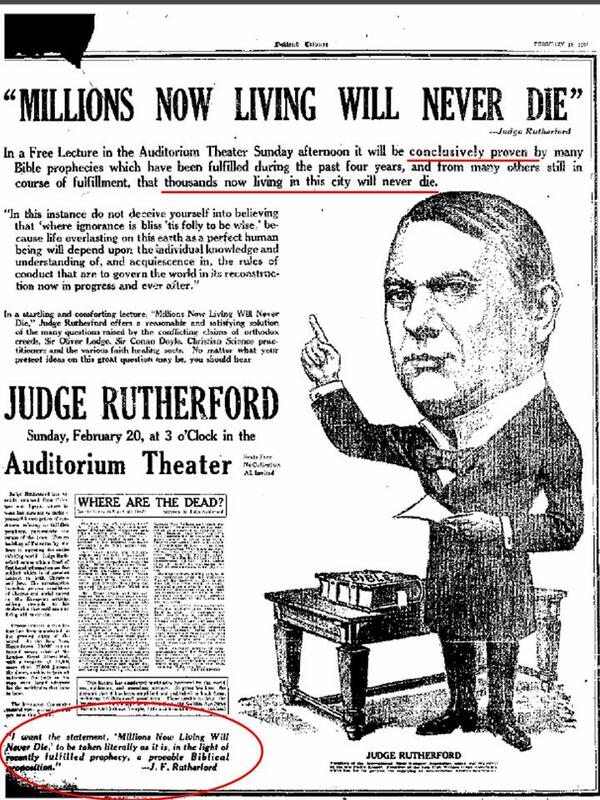 Rutherford’s message was not that a Great Crowd of millions of Witnesses were never to die – it was in fact the very opposite. Rutherford was writing that the few thousand Bible Students would die and go to heaven, as either the Great Crowd or the Little Flock. At that time, the teaching was that the Great Crowd went to go to heaven. 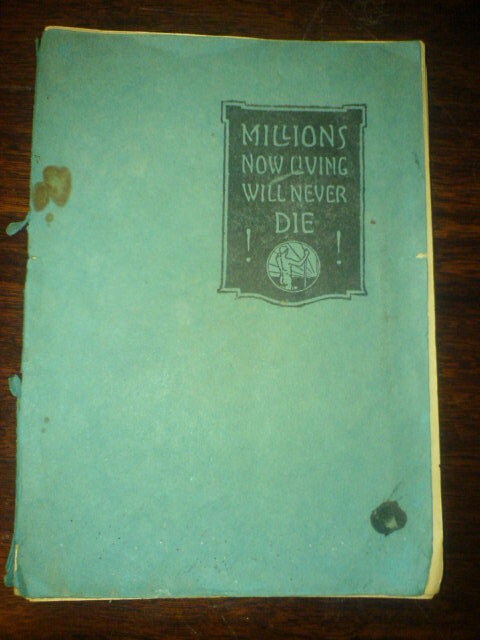 The “Millions” that Rutherford was referring, whom would never die, were the rest of humankind alive at that time. Russell had proposed that followers of the Watchtower Society were to go to heaven, whilst most of humanity would survive Armageddon to be educated personally by Jesus in paradise earth. Rutherford continued to promote this teaching. In the New System, freed from the influence of Satan, Jesus would directly teach all people and give them the opportunity to choose if they wished to live forever serving him. Salvation was not contingent on becoming a Watchtower follower, or even a believer in Jesus. In fact, the churches were criticised for teaching that their members exclusively would be saved. “The church systems would have the people believe that only those who become church members can be saved. The Bible never taught any such doctrine. … Jesus died not only for those who will constitute the members of the church, but for all. St. John plainly stated: “He is the propitiation [satisfaction] for our sins: and not for ours only, but also for the sins of the whole world”.-l John 2:2. It would be impossible for the human race, therefore, to accept the gift of life everlasting before it is offered. It will be offered only in God’s due time and the divine plan shows that his due time is after the seed of promise is developed, after the kingdom is setup; and then each one in his order will be brought to a knowledge of the fact that a plan of redemption exists and that the way is open for him to accept the terms of it and live. The remainder of mankind could not keep it. They hear, however, in due time after the establishment of the kingdom. Then it shall come to pass that every one who will keep the saying of the Lord shall never see death. Page 333 goes on the describe God’s promise to Noah never again smite “every living thing” as proof Armageddon will not result in a great human slaughter. “The majority of mankind practice unrighteousness” (p.334) and these are the ones that will be given the opportunity to learn to practice righteousness during the reign of the Messiah. This was a fair concept that showed God’s love and reasonableness towards humankind. Proclaimers deceptively claims that the failure of 1925 affected just a small minority, whereas we have seen from Watchtower statistics that over half left the organisation. An interesting tactic that downplays the importance is seen in the following quote. It is admitted that attendance dropped “in France and Switzerland”, which can misleadingly make it seem other countries were not equally affected. Similar intellectual dishonesty can be identified in the 1980 Yearbook, which misquotes from the Watchtower of 1926 in an attempt to downplay the sentiment of 1925. Notice how only half a sentence is quoted, with a full stop replacing a semi-colon. 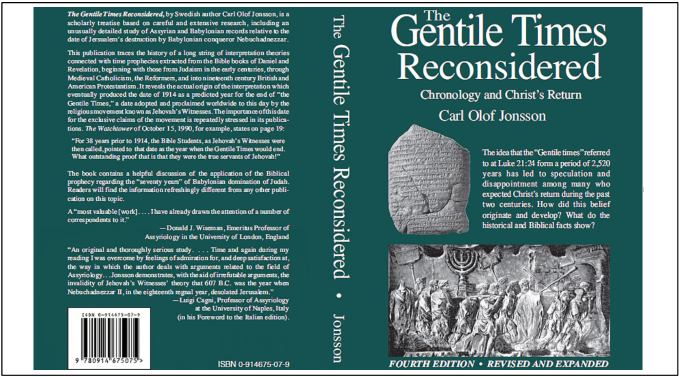 “Question: Have the ancient worthies returned? 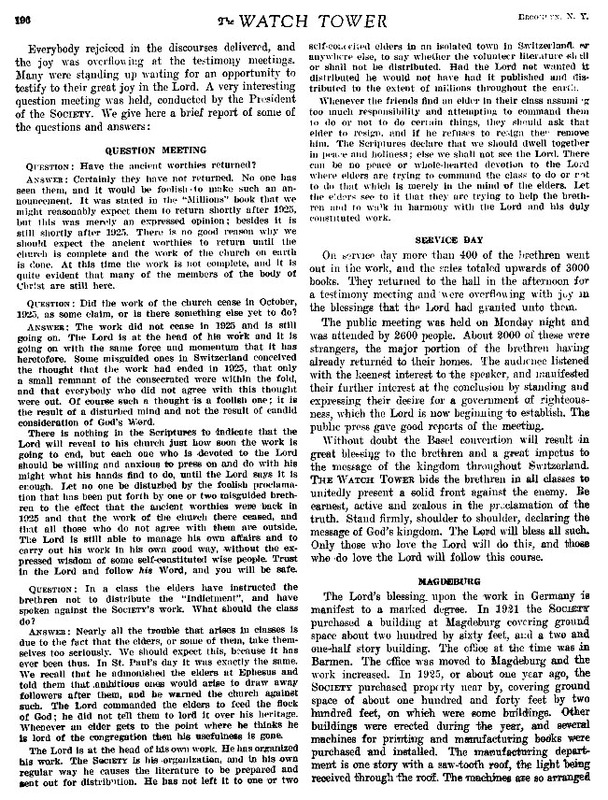 1925 was Rutherford’s defining prophecy, as Rutherford used it to rebuild Watchtower membership after the failure and disappointment of 1914. 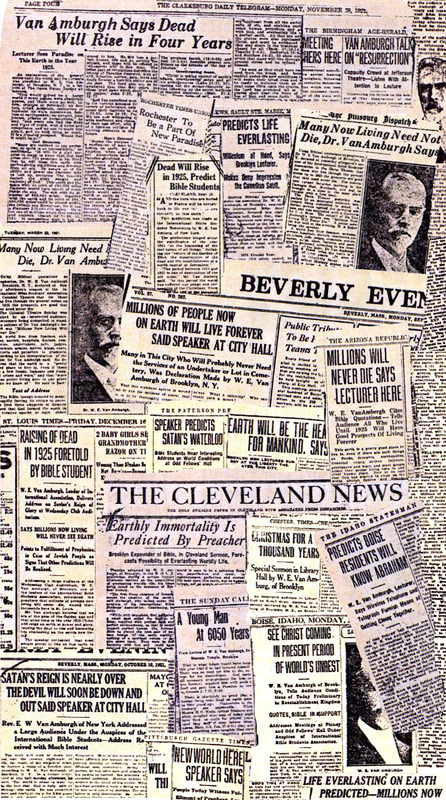 However, it was the failure of 1925 and what it led to that resulted in even more important consequences for today. 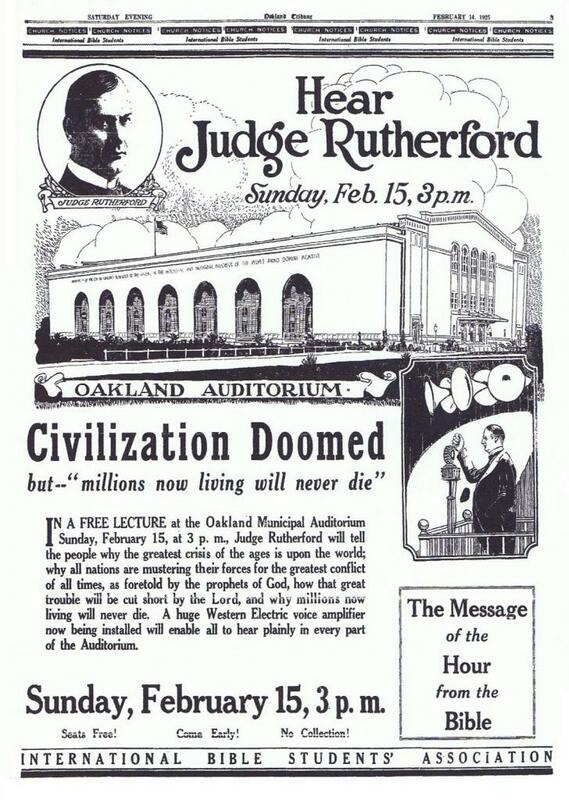 Following his failed 1925 prophecy, Rutherford embarked on a dramatic overhaul of Watchtower doctrine, distancing his followers from Russell. Almost all of Russell’s time prophecy predictions were discarded. Use of the word Jehovah began to be emphasised (see God’s Kingdom of a Thousand Years Has Approached p.288; Proclaimers p.152), leading up to a name change for Watchtower followers from Bible Students to Jehovah’s Witnesses. 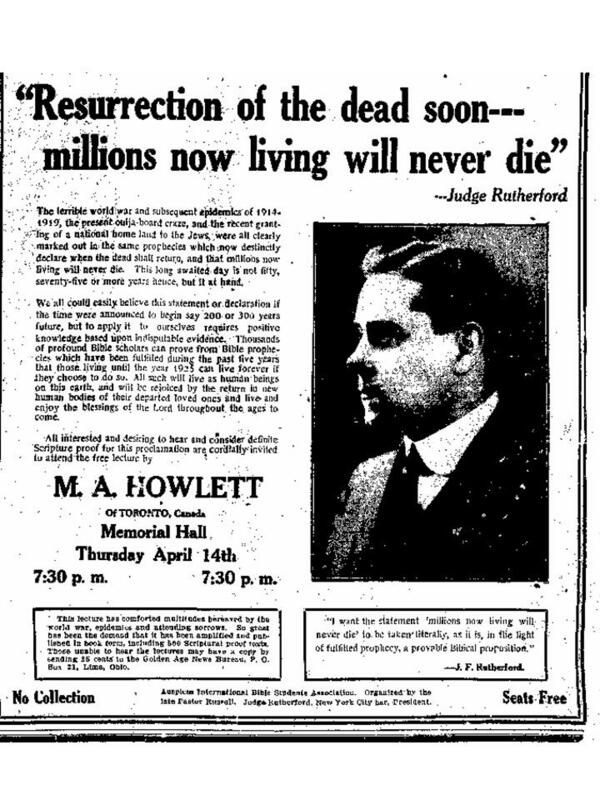 Furthermore, it was stated that between 1918 and 1919 Jesus cleansed the Watchtower Society, in effect implying that the time of Russell was one of uncleanness, and it was under Rutherford that Jesus chose the Organization as his sole provision for salvation. Rutherford distanced his followers from other Christians by stating as wrong and pagan most of Christendom’s symbols and holidays. Finally, the great crowd was moved from heaven to earth, to become the sole survivors of Armageddon. These changes made it simple to introduce a concept of ‘narrow salvation’, the concept that only a handful of the world were deserving salvation. Conveniently, survivors now had to belong to one earthly Organization, the Watchtower Society. God was prepared to kill billions of people, most that have never even heard of the Watchtower Organization. The Bible explains that Jesus Ransom was for all mankind, even the ungodly. Rutherford’s post 1925 belief structure removed the value of Jesus sacrifice from “all mankind” and placed his followers alone amongst the living as worthy of its benefits. This unfortunate view eliminates most of the value of Jesus sacrifice for those alive at Armageddon and paints a cruel and unjust God. This viewpoint cannot be justified by reason or Scripture, yet is common amongst fundamentalist religious groups, due to being an effective way to encourage membership and prevent defection. 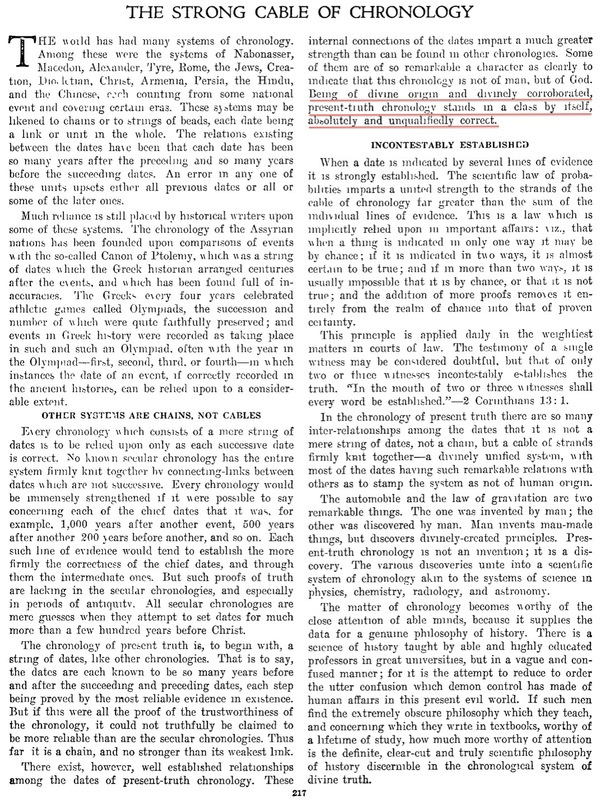 1 Russell’s will appears in Studies in the Scriptures – The Plan of the Ages, 1927 Edition “Biography” pp.8-14. Here he directed that rather than a single person having full control as he had done, an Editorial Committee of five (the names of which are listed in the will) be in charge of approving Watchtower truth. Rutherford contested this and took control as president.